Earlier this week, I went to Great Falls Park to continue a photography project I have been on this summer (which I hopefully can release sometime soon). What I didn’t expect was to shoot a panorama, as well! But once I saw the moon peak out of the southeastern sky, I knew I had to try. The key to panoramas is to limit distortion and provide enough overlap between images so that the stitching software has a frame of reference to join exposures. While the former statement is not completely true for “Perspective” stitches, it is for traditional panoramas. Another key to a good panorama is to have enough interest to fill the entire frame, just as that is important with any photograph one should take. Although panoramas are slightly different in that they are made to be seen large and that vast open space can sometimes be a good thing, you need to have some strong focal points in the image. 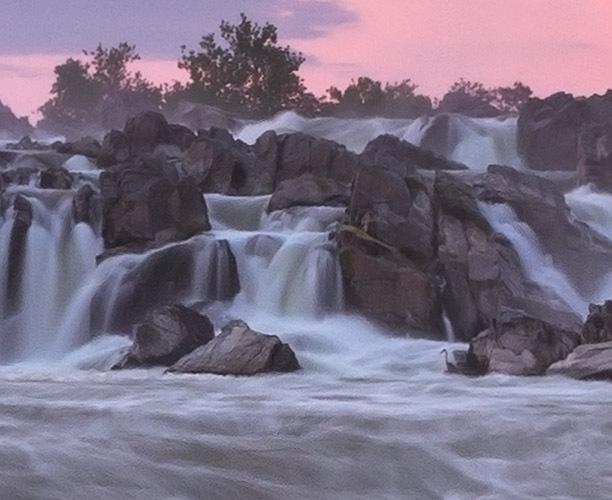 Here’s my most recent panorama from Great Falls National Park. If you want to know how I make my images, join my summer bootcamp which has just started! The next class is on July 27. I really enjoy teaching and thus far have gotten really good reviews. I hope that teaching these classes can lead to something more fruitful in the future. One thing to note about this image. There are several “easter eggs” that you may find in the larger version (you probably can’t see them in this version). A zoom at 200% at the very base of the rapids and you can see one of the four Great Blue Herons I found in this image. There are probably more I haven’t found! Another advantage of panoramas — you can get crazy resolution!